is a genus of flowering plants in the mallow family, Malvaceae. It is quite large, containing about 200–220 species that are native to warm-temperate, subtropical and tropical regions throughout the world. 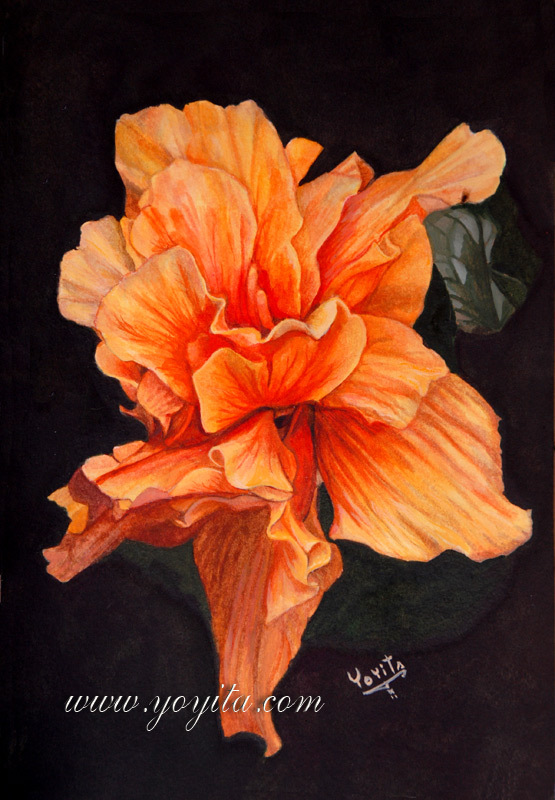 Member species are often noted for their showy flowers and are commonly known as hibiscus or sorrel or less widely as rosemallow or flor de Jamaica. The genus includes both annual and perennial herbaceous plants, as well as woody shrubs and small trees. The generic name is derived from the Greek word ἱβίσκος (hibískos), which was the name Pedanius Dioscorides (ca. 40-90) gave to Althaea officinalis. The leaves are alternate, simple, ovate to lanceolate, often with a toothed or lobed margin. The flowers are large, conspicuous, trumpet-shaped, with five or more petals, ranging from white to pink, red, orange, purple or yellow, and from 4–18 cm broad. Flower color in certain species, such as H. mutabilis and H. tiliaceus, changes with age. The fruit is a dry five-lobed capsule, containing several seeds in each lobe, which are released when the capsule dehisces (splits open) at maturity. Many species are grown for their showy flowers or used as landscape shrubs. Many species are used to attract butterflies and bees. Hibiscus is also a primary ingredient in many herbal teas. One species of Hibiscus, known as Kenaf (Hibiscus cannabinus), is extensively used in paper making. Another, roselle (Hibiscus sabdariffa) is used as a vegetable and to make herbal teas and jams, especially in the Caribbean. One species of Hibiscus, known as Kenaf (Hibiscus cannabinus), is extensively used in paper making. In Jamaica and many other islands in the Caribbean, the drink is known as sorrel (Hibiscus sabdariffa; not to be confused with Rumex acetosa, a species sharing the common name sorrel) and is considered a quite popular at Christmas time. It is served cold and mixed with other herbs, roots, and spices and sweetened with cane sugar. Often it is served mixed with Jamaican rum or wine but is also refreshing without any alcohol. Roselle is typically boiled in an enamel-coated large stock pot as most West Indians believe the metal from aluminum, steel or copper pots will destroy the natural minerals and vitamins. A large quantity of the flower is used to ensure a thick dark red tea is made. The tea is popular as a natural diuretic and contains vitamin C and minerals and is used traditionally as a mild medicine. All over the world, the tea drink is consumed hot or cold. It is known as Bissap in West Africa, Karkady in the Middle East, flor de Jamaica in Mexico, Gongura in India and Brazil. Some refer to it as roselle, a common name for the hibiscus flower. In Mexico, it is well known for its color, tanginess and mild flavor; once sugar is added, it tastes somewhat like a more intense herbal and berry (cranberry, raspberry, etc.) infused tea. Dieters or people with kidney problems often take it without adding sugar for its beneficial properties and as a natural diuretic. Certain species of hibiscus are also beginning to be used more widely as a natural source of food coloring (E163), and replacement of Red #3 / E127. Hibiscus species are used as food plants by the larvae of some Lepidoptera species including Chionodes hibiscella, Hypercompe hambletoni, the Nutmeg moth, and the Turnip Moth. The Hibiscus is used as an offering to goddess Kali and Lord Ganesha in Hindu worship. Hibiscus rosa-sinensis is considered to have a number of medical uses in Chinese herbology. The bark of the hibiscus contains strong bast fibres. They can be obtained by letting the stripped bark sit in the sea in order to let the organic material rot away. In Polynesia these fibers (fau, pūrau) are used for making grass skirts. They have also been known to be used to make wigs. Hibiscus, especially White Hibiscus and Red hibiscus (Hibiscus rosa-sinensis), is considered to have medicinal properties in the Indian traditional system of medicine, Ayurveda. Roots make various concoctions believed to cure ailments such as cough. The flowers are boiled in oil along with other spices to make a medicated hair oil to prevent greying and hair loss. The leaves and flowers are ground into a fine paste with a little water and the resulting lathery paste is used as a shampoo plus conditioner. A 2008 USDA study shows consuming hibiscus tea lowers blood pressure in a group of pre-hypertensive and mildly hypertensive adults. Three cups of tea daily resulted in an average drop of 7.2 point in their systolic blood pressure, compared to a 1.3 point drop in the volunteers who drank the placebo beverage. Study participants with higher blood pressure readings (129 or above), had a greater response to hibiscus tea, their systolic blood pressure went down by 13.2 points. This data supports the idea that drinking hibiscus tea in an amount readily incorporated into the diet may play a role in controlling blood pressure, although more research is required.